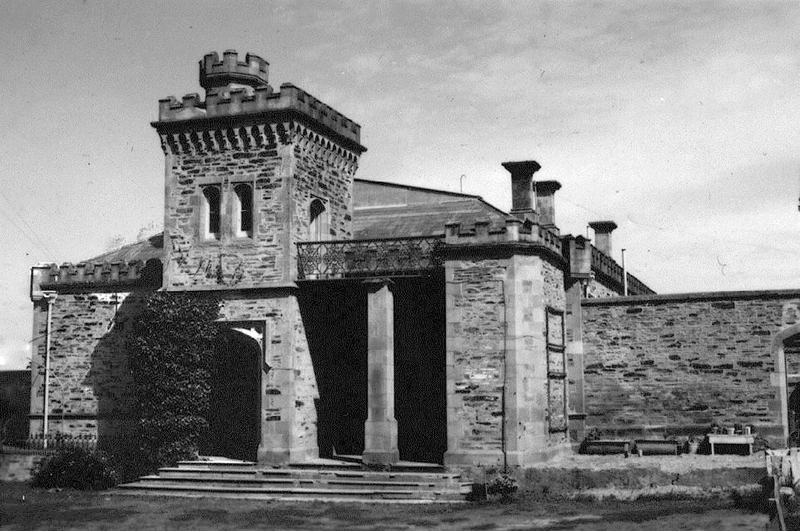 Below: Turretfield homestead and Research Centre office in 1970. The Turretfield Research Centre was established in 1909. 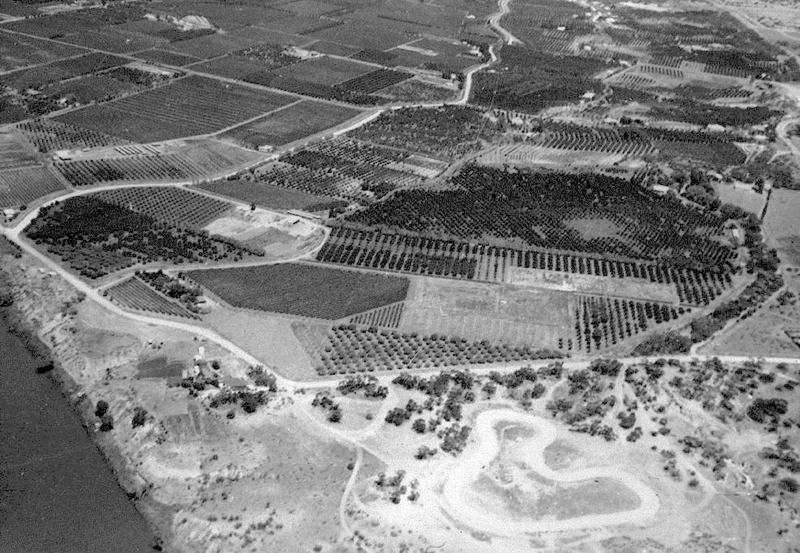 Below: Aerial view of Berri Experimental Orchard 1961. 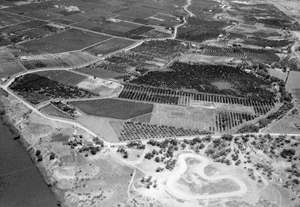 Berri was established as the main Riverland irrigated horticulture research centre in 1911 during William Lowrie’s directorship. William Lowrie was a science and arts graduate of Edinburgh University. He arrived at Roseworthy College in 1888 to take up the position of Professor of Agriculture and Principal. He continued Custance’s important work with phosphate fertilizers and crop rotations and formed a strong partnership with Arthur Perkins, viticulturist at the College from 1892. Working together, Lowrie and Perkins were influential in getting the government to establish effective units for securing the quality of South Australia’s important butter and wine exports to the United Kingdom. These units, along with the Government Produce Department in Adelaide and the Wine and Produce Depot in London, proved highly successful in boosting the Colony/State’s reputation as an exporter not only of wine and butter, but also of eggs, fresh fruit, honey, beeswax, almonds and frozen meat. Through the 1890’s, Lowrie was still active in popularising superphosphate and conducting experiments on private farms. Perkins had been appointed State Viticulturist also based at Roseworthy. The Phylloxera and the Vine, Fruit and Vegetable Acts had come into force and the Government Produce Department was flourishing. In 1901, Lowrie resigned as Principal of Roseworthy following disputes with the superintendent of public buildings about the college’s requirements. He then took up a position as Director of Cantebury Agricultural College in New Zealand. 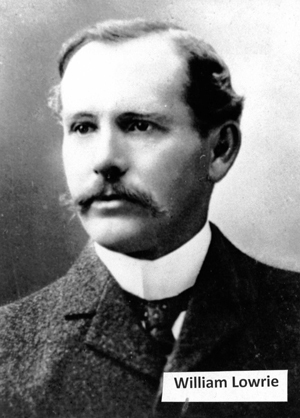 He returned to Australia as Director of Agriculture in Western Australia in 1908. J.D. Towar was then appointed as the Principal of Roseworthy College, but resigned in 1903-04, and Perkins was appointed in his place. When Lowrie took up a second stint as the SA Department of Agriculture’s Director of Agriculture from 1911 to 1914, he consolidated many of the developments which had begun under Angus’ direction. He resigned in 1914 after disputes with the Minister of Agriculture about restructuring the Department. The major developments in his Directorship period were the establishment of the experimental orchard at Berri, the decision to abandon dairying at Turretfield and concentrate on seed wheat production, the closure of experimental operations at Parafield (wheat only), Loxton, Shannon (Eyre Penninsula) and Minburra (near Orroroo), the concentration of all poultry experimental work at Parafield and the first use of a South Australian-based consultant on plant diseases. During Lowrie’s directorship, T.G.B. Osborn was appointed as Professor of Botany at the University of Adelaide. He had expertise in fungi and fungal diseases of plants, and was regularly used from 1911-12 by the Department of Agriculture to identify the causes of plant diseases and recommend treatments. Osborn’s Botany Department also provided a plant identification service, mainly to assist in weed control work. In 1914, Lowrie retired to his Border Leicester sheep breeding and farming enterprise near Echunga where he lived until his death in 1933. Allan W. Black, (1986); “Lowrie, William (1857-1933)”, Australian Dictionary of Biography, National Centre of Biography, Australian National University.